Product weight is 2 lbs. Gold Standard 100% Whey delivers 24g of whey protein, has 5.5 grams of naturally occurring BCAAs, and 4 grams of naturally occurring glutamine per serving. Gluten Free. Over 20 delicious flavors! Comes in multiple sizes, most popular are 5, 2, 10, and 1 pound sizes. Have an Alexa device? Enable our "Optimum Nutrition Workout Recipes" Skill! Whey protein shake consumed before or after exercise helps kick start muscle recovery for men and women. Frequently purchased with ON Creatine, ON Amino Energy, and Opti-Men Optimum Nutrition's Gold Standard 100% Whey uses pure Whey Protein Isolates as the primary ingredient. Combined with ultra-filtered whey protein concentrate, each serving provides 24 grams of all-whey protein and 5.5 grams of naturally occurring Branched Chain Amino Acids (BCAAs) which are prized by athletes for their muscle building qualities. With more than 20 tempting flavors to choose from, ON’s Gold Standard 100% Whey gives you plenty of ways to keep workout recovery interesting. Search "ON Apparel True Strength" to see our new ON clothing line! 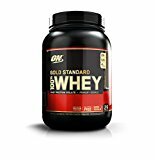 Optimum Nutrition Gold Standard 100% Whey Protein Powder, Vanill.. I like the Vanilla Ice Cream flavor, as well as Double Rich Chocolate and Chocolate Mint (the best one, in my opinion -- really tastes like a treat, even when just mixed with water).I have also tried Extreme Milk Chocolate and Cake Batter. Maybe because I'm a supertaster, but these were so overly sweet and chemical-tasting, I could hardly swallow them.I later examined the ingredients and found that these 2 flavors contain sucralose in them. The 3 ..
Optimum Nutrition Gold Standard 100% Whey Protein Powder, Banana..
Due to some health issues I had to switch up my diet. I'm so bad about the whole macros/meal planning/fitness thing. I knew I needed more protein in my diet, but also had to stick to lean meat only. I've never done protein supplements but all of the people I know that workout consistently swear by it to keep their muscles strong. So I took a chance and bought the two pound banana cream. MY. GOD. this is delicious. I get so excited to drink it! I'v..
Not much else can be said about the quality of this Whey Protein powder.I will comment on the taste and other things instead. I ordered the Double Rich Chocolate and every time I use it I mix it with a cup of milk. The taste is awesome, a bit more bland (or less rich) than store bought chocolate milk but those are usually too rich anyway. I do however find that it is difficult to dissolve all the powder. I follow the instruction to use one rounded..
Kwun (Santa Clara, CA Un..